For our final project, we decided to do something a little different. We understand while a major part of this class focuses on street food, we took the liberty of making this project something that we could call our own. Or as much of our own as possible. This project is not about us. This project is about the community in which we followed that belongs to the people. It is not about the specific, individual stories. 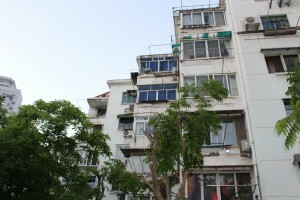 People are just sums of the product that reside in the little enclave that exists between Weifang Lu & Zhangyang Lu, just a street over from Century Avenue. Shanghai, China. The largest city in the world by population with upwards of 24 million inhabitants living within the defined boundaries. Within these boundaries, Shanghai is a city that continues to grow and sees change happening everyday. Marked by its impressive skyscrapers and the fast-paced hustle and bustle of the urban city life, Shanghai is a place where you expect to find the continual progression towards providing a glimpse into the future of modern metropolises. Despite the understanding that Shanghai is a booming city that will continue its impressive growth, an interesting phenomenon must be acknowledged. 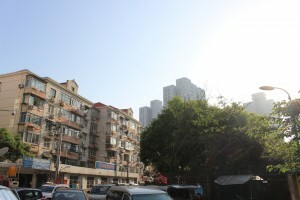 Even in the business district of Pudong, only a street over from Century Avenue, lies a small community that seems to have avoided this systematic transformation of Shanghai. All over the city, the process of gentrification has been seen, from the demolition of small enclave neighborhoods to the shutdown of popular street food streets, such as Wujiang Lu. 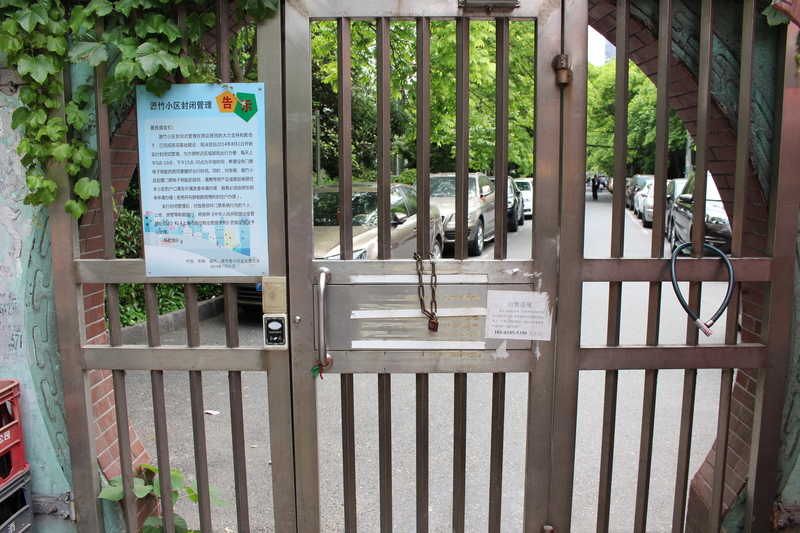 Countless examples of governmental shut downs and transformations can be examined in the Shanghai context, but how do we explain the small communities that still exist? Located in between Weifang Lu and Zhangyang Lu lies a small community of people who continue to lead their lives in this “old” neighborhood. It’s definitely a sight to see because of the stark contrast that it provides when put up in comparison with the modern buildings on the nearby Century Avenue. Its unimpressive facade seems contradictory especially when one thinks of Pudong, they think of Lujiazui and other fancy business establishments. 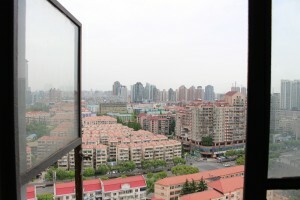 However, in our discovery of this small enclave, there seems to be hope that these small communities still do exist in Pudong. 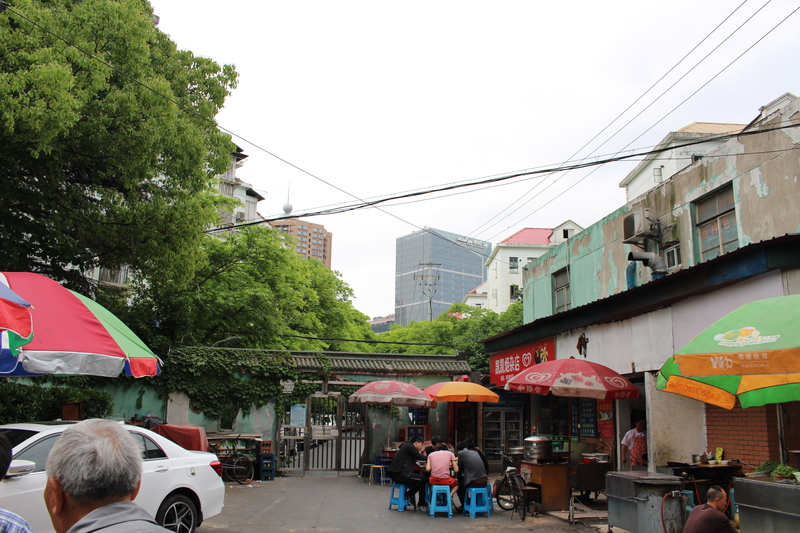 This neighborhood has a history of 26 years, as most of its residents are local Shanghainese, but almost all the store owners and street food vendors are migrant workers. 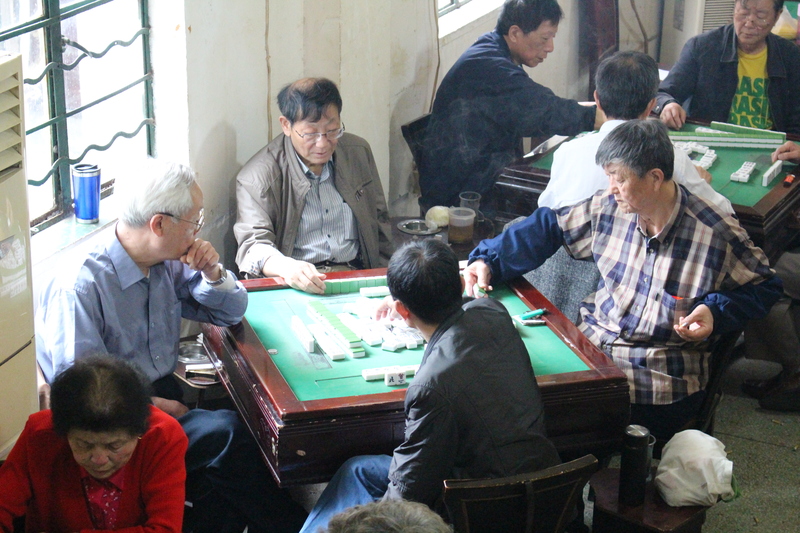 There is a two-story mahjong room inside this community whose entrance isn’t that easy to find, and when we walked in we found this to be a very packed space with a lot of aged men and women playing “mahjong”, and we two are very conspicuous among them. A place like this is common in any typical Chinese neighborhood, especially old ones, and to those residents mahjong means more than a game. Mahjong culture means a lot to a Chinese neighborhood because in Chinese tradition neighbors are supposed to be friendly with each other. There’s even a saying goes 远亲不如近邻, meaning that a distant relative is not as good as a near neighbor. In a community where the older generation forms a large portion of the population, a communal space like this is very important for them to socialize, or to spend their time in the daytime when their children are away studying and working. 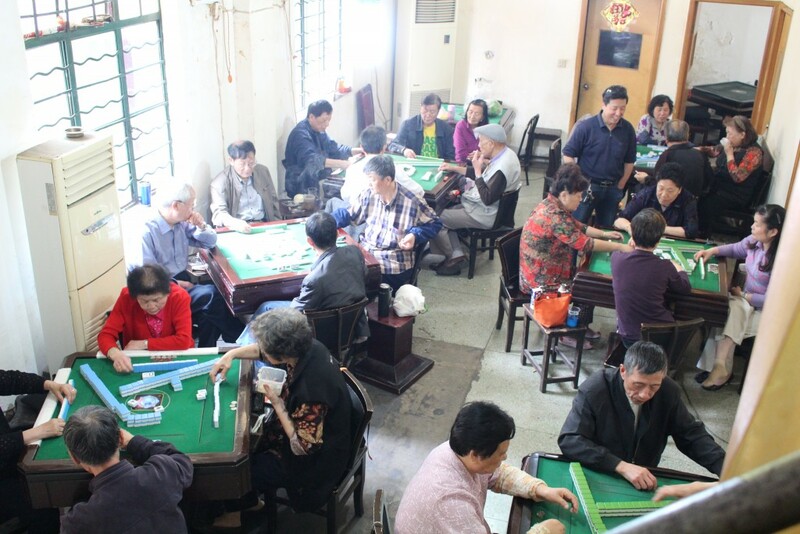 What’s more, the mahjong room together with people playing mahjong is like a community within a community that gives people a sense of belonging. We find this community to be a very self-sustainable area where there is a kindergarten, a primary school, a middle school, a market with a wide selection, several fruit shops, one or two barber shop even small estate companies, and tons of street food both in the morning and in the afternoon. Some of the stores open only before 10 a.m, some after 3 p.m, and others for a whole day. A great variety of food types can be found there, partly because those vendors are from different places of China and tend to bring food from their hometown to Shanghai. 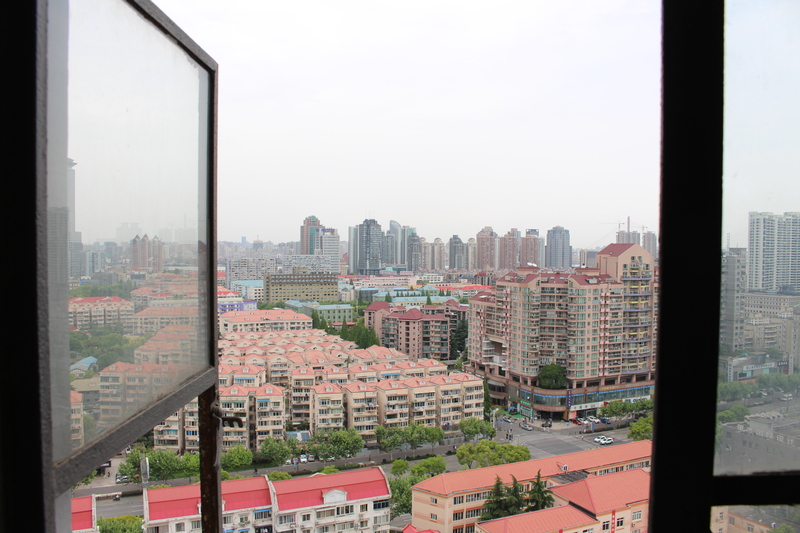 It is a bit surprising for us to find such a place in Pudong, especially when it is located close to Lu Jiazui, the financial center of Shanghai. The “street food culture” is undoubtedly more lively in Puxi than it is in Pudong, but Yuan Zhu Xiao Qu is an exception. The following is based on our interview with a couple who sells fried food in a small store right next to the market in Yuan Zhu Xiao Qu. “We’ve been here for ten years and know a lot of residents and store owners here very well, in fact many of them have been our customers for a really long time. All of my family members sell street food in Shanghai, but they all settled in Puxi, where business is supposed to be better. But being in this neighborhood is different, it is always bustling with life. This neighborhood stays pretty much the same for twenty years or so when its surroundings has experienced so many changes, and a number of tall buildings are newly built recently. We asked if there will be any relocation of housing construction(动迁), and the residents honestly believe that there won’t be any. We also had several chats with some residents there. (We went there at around 1pm, and barely see any young people there) One of them has lived here for 20 years. His daughter grew up here with him, but moved away after she got married. What is the significance of all of this? Believe it or not, there is actually a method to our madness and a motivation behind this project. We didn’t focus on street food entirely because we believed there was more to be told than just street food in itself. This class has offered us a glance into the street food life and what it means to cities and how they operate. So we went ahead and expanded on that further by exploring what it means in that sense. Why do these street food establishments exist and why is it something that is frowned upon when it brings cultural value to city streets? From that guiding question, we were moved to think about what that means in the context of things that are not necessarily modern, especially in Shanghai. From there, our exploration of this small community began. Why is it that this little community exists when there is so much gentrification that is happening all around the city? While there won’t be a clear answer that we can know (the city planners may already be in the process of finding ways to deconstruct? ), what we do know is the life hidden behind the facade of the modern Shanghai. There is life in these walls and that is something that no government regulation can take away. Our biggest takeaway from this and what we hope viewers can take away is the general understanding that life here exists. And it waits for nobody. Things go on, but life continues to move on. From the interviews that we conducted, the general understanding that we concluded was that the area is full of migrant workers. None of them stay for the entire haul of the existence of the neighborhood. People move on. Some stay behind. Quite simply, that is how life is. Some people aspire to do greater things and will jump at the opportunity for greener pastures. Some may find their own little niche in their neighborhood but eventually leave for some reason. Some end up staying there and raising a family, and the offspring may look to move on somewhere else. The way of life that exists in these parts very much mirrors the lifestyle of Shanghai. In a hustling city like Shanghai, with many migrants out there to make it big, some people find it in the city that they want to stay and others move on. There is no right answer to a person’s life choice and their success is arbitrarily decided. People can do what they want for themselves and that’s fine. That’s the way life is and there’s nothing that can change it. People just learn to adapt to changes and learn how to live their lives. Things happen. And life moves on. And everything pans out. That is why we decided not to focus on any particular aspect of a specific street food area. Or on singular stories. While we acknowledge the importance of everyone’s story, our focus was to explore an area. And that is what we did. The stories of each person contributes to the overall narrative of a place. And that is what we got to see. People live their lives and there’s something special about the fact that people will hustle in this life to get where they want to be. Where their journeys lead them and their settings will always be dynamic. But it’s the personal choice they have to try for something that is cool to see. There’s also this other interesting thing that we came to conclude after putting this project together. Because Shanghai is such a large city with so many people, honestly? People don’t matter. People are replaceable. Faces don’t matter. Anyone can fill the void and present their own story. What difference does it make? That is the fascinating thing about this the community. It doesn’t matter who lives in it. There is no one particular person that makes the area what it is. But that’s just the way that life is. With everything. But it’s interesting right? Perhaps we can take solace in the fact that none of us matter in the grand scheme of things so we can share our worthlessness together. This relates to our class. It may not seem like it at first because it isn’t a project that isn’t heavily focused on food. But the takeaways from the project match the general theme that our class has followed through this semester. We’ve learned much about the importance of street food to the culture of a city. However much of these street food vendors are temporary. They are migrant workers that won’t necessarily last. At a macro scale, they make absolutely no difference. But on a micro scale, they have contributed to the story of an area. Just like this area. The people come and go, but the place stays. They all make their mark in some way, but won’t necessarily be remembered for that. It just feels like the story of a migrant street food vendor. The ones that we talked to talked a lot about the idea of just trying to make a better life for themselves. Street food may be their only choice and they might not necessarily like it. But they eventually leave. They go about, moving along in their life. And the cycle continues with the perpetual change of the city, the street food and life in general. Here is a video of what we accumulated. There are no words. Just video. We just want to show life.